Can Core Flexibility Training Improve Your Performance? The idea of core flexibility training might seem a little strange to you, but if you think about it, flexibility is a key component of fitness. Your trunk is expected to be mobile around three different planes of movement and in some cases produce these movements with power and precision. Consider further that the ability to produce power is determined in part by the range over which force is applied. You can now see how core mobility training is going to be important to sports people in general. Range of movement is just another way of saying flexibility. Your core muscles have two functions, to stabilize the joints of the spine and to produce movement through several planes. Those muscles that stabilize the spine develop tension but produce no movements. These muscles do not produce movement because they have very short lines of pull. For movement to occur, other muscles within the trunk have the responsibility to move the torso through the different planes identified above. They are able to produce movement because they have longer lines of pull. For you to be able to express power through muscular contraction, the range over which force (the pull) is applied is going to be important. If you were now restricted in the movements around your trunk, your ability to produce force through your core would be compromised. And that is why core flexibility is important for power around the torso. Let’s now consider you as a golfer preparing to drive a shot down the range. You stand over the ball with your club in hand. 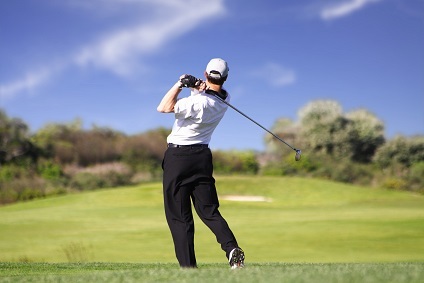 As you withdraw the club in preparation to strike the ball, the pelvis, trunk and shoulder must turn away from the ball. As you apply muscular force to strike at the ball, the mechanics of the movement demand that there is separation between the rotations of the pelvis, trunk and shoulder. By that I mean that the pelvis turns first, then the trunk, then the shoulders. If you lack flexibility around these joints the rotation that is required of the upper body will be initiated by all the joints at the same time, rather than one after the other. Lack of core flexibility in this case would mean that you wouldn’t have the timing, precision and power to execute an efficient fairway drive – your technique is compromised! Below you will find an exercise to include in your flexibility training for your core. It is a torso mobility exercise which is designed to increase your range of movement around the trunk. Specifically, it increases the flexibility of the mid-back and pelvis and integrates the rotation from the foot right through to the top of the neck. Begin by standing with bare feet, about hip width apart, press feet firmly to the ground. Turn and look behind you, noting a spot you can comfortably see. Turn and look in the other direction, again noting a spot that you can comfortably see. As you turn, notice the pressure you feel in your feet. For example as you turn to your left, you should feel pressure move to the outside of the left foot and the pressure moves to the inside of your right foot. The reverse is true turning to the right side. Notice in which direction you feel most restricted and turn in that direction, looking at the spot you noticed the first time round. Feel the pressure on the outside of that foot. Keeping your body in that position, smoothly shift the pressure from the outside of that foot to the inside, do this 10 times. Now, keep the pressure on the outside of the foot and turn in the opposite direction. Perform several turns in this direction keeping your weight distributed on the outside of the foot. Return to your original starting position of facing forwards. You should now retest your movement, allowing your feet to move normally. You should find that you have increased your range of movement. For balance, repeat the exercise on the other side. I have found this to be a very useful exercise for core flexibility training. From "Can Core Flexibility Training Improve Your Performance?" To "Faster, Stronger, Better – Your Shortcut To Improved Athletic Performance"
Learn more about Core Training.